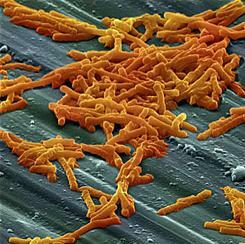 Clostridium difficile, more commonly referred to as C. diff, is a bacteria that makes half a million American's sick each year, and is responsible for over 25,000 deaths annually, both directly and indirectly. The bacteria can lead to serious illnesses in the gut, that can cause diarrhea and colon inflammation. Often times, C. diff infections can be caused by the over use of antibiotics, which affect the healthy bacteria in the gut and provide opportunity for C. diff bacteria to grow in that area.